Again, it's been a super busy week for me concerning work so that is why I've had unfortunately a limited amount of time left for my blog. However, I'm full of new stories to tell! To continue telling about my last weekend in my lovely home town, I also wanted to show you some pictures of two of the most interesting urban areas in Helsinki. The first one is called Arabia, and last weekend it hosted an urban festival that included food, street dance and art, shopping possibilities and a huge flea market. The Arabia district is of course known for the astonishing ceramics factory Arabia. 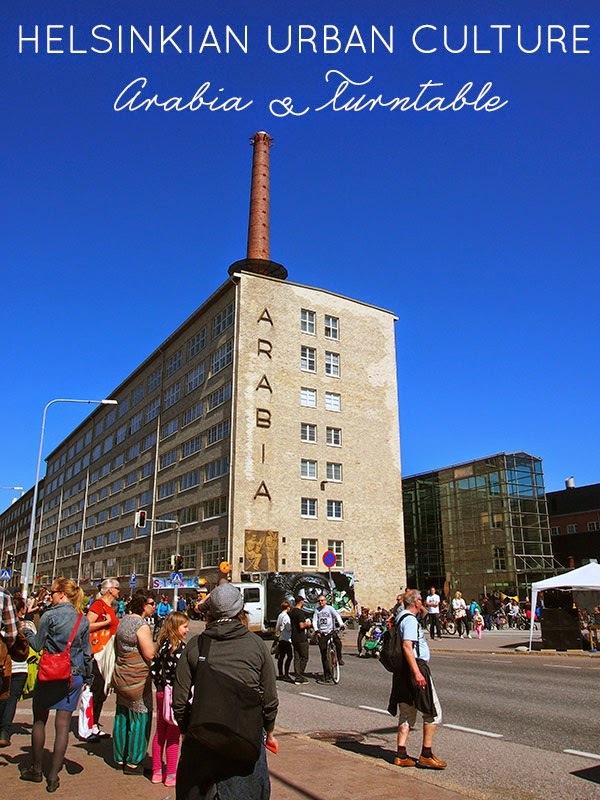 The Arabia brand is a pioneer of Finnish design. The product range consists of popular dish sets and interior design and gift products. Creative design, ceramic know-how and brand management create the core of Arabia. All our plates and mugs at home are from Arabia, it's a part of Finnish long-lasting and quality everyday design. Taas minulla on ollut todella kiireinen ja työtäyteinen viikko. Olen kuitenkin tarioita täynnä tämän viikon jälkeen! Jatkaakseni viime viikonlopusta, kävin kahdessa mielenkiintoisessa kaupunginosassa: Arabiassa kaupunginosan katufestivaalissa sekä Pasilassa (Kääntöpöydällä). Me and my friend enjoyed a burger at Arabia and she actually found some second hand goods there as well (a lamp and some shelves). How convenient! Ystäväni kanssa käytiin katufestivaalissa hampurilaisella ja kaverini löysi myös kierrätyspisteestä seinähyllyjä ja valaisimen - miten kätevää! Later, we headed to one of the coolest places in Helsinki (if you ask me) - Turntable! 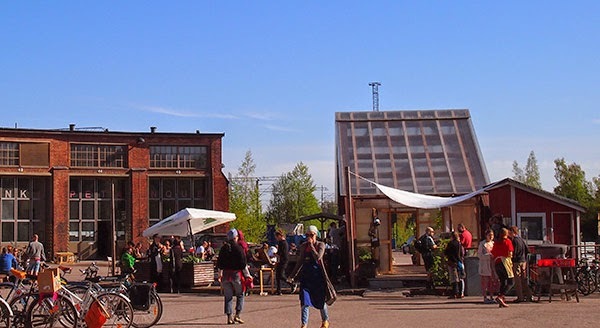 Turntable is an urban farm, located in the heart of Helsinki, in the old railway depot of Pasila. How cool is that? A cast-off engine turn table acts as the framework for this modern greenhouse oasis of urban gardening. The premises include a greenhouse, cultivation cribs, and a summer café with a terrace, many kinds of cultivation activity, workshops, markets, food, and cultural events. The whole thing is run by Dodo ry. It's a secret paradise if you ask me! Its rough urban surrounding appeals to me. We enjoyed some nettles falafel, delicious raw cakes and chaga tea at Turntable. When we sat at the table and ate in good company, I experienced such a rush of a good sensation. It's something about Helsinki - only here one can feel that life is that good! Myöhemmin kävimme yhdessä Helsingin makeimmista paikoista, eli Kääntöpöydällä! Kääntöpöytä on Dodon kaupunkiviljelypuutarha, kahvila, kasvihuone ja avoin kaupunkitila Pasilan historiallisessa rautatiemiljöössä. Pasilan ratapiha on Dodon kaupunkiviljelyn alkupiste jo vuodesta 2009, jolloin ensimmäinen kaupunkikasvimaa perustettiin. Vuonna 2012 perustettu Kääntöpöytä toimii sekä kaupunkiviljelyn kokeilukenttänä että oppimisen ja inspiraation lähteenä. Kääntöpöydällä järjestetään talkoita, työpajoja, nautiskellaan Kääntöpöydän minttuteetä ja luomubrunsseja, opitaan luomuviljelystä ja viedään kasvun siemen muuallekin kaupunkiin. Nautimme paikan päällä nokkosfalafeleistä, raakakakuista ja pakurikääpäteestä. Kun istuimme pöydässä, tunsin voimakkaan kiitollisuuden tunteen, jonka olen vain kokenut Helsingissä - vain täällä elämä voi tuntua näin hyvältä! 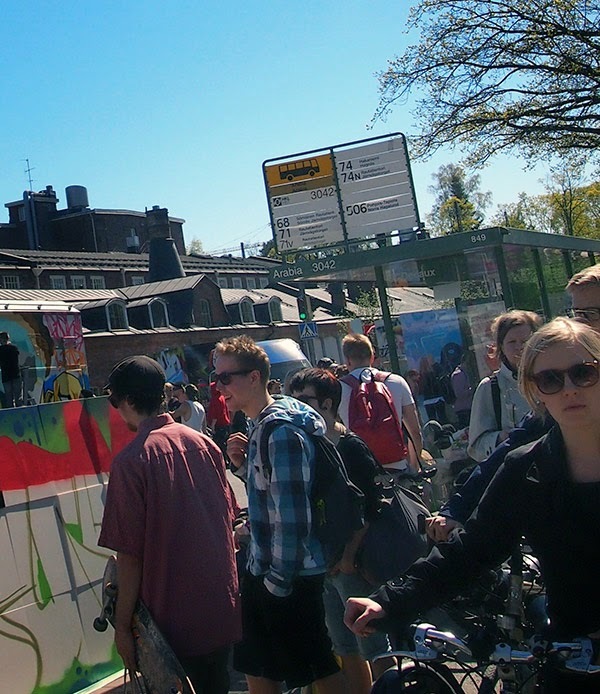 How do you feel about urban surroundings? Do you like visiting factories and see how e.g. ceramics are being produced? Do you participate urban events? How do you feel about urban farming? Mitä mieltä olette näistä ympäristöistä? Vierailetteko usein tehtailla? Osallistutteko kaupunkitapahtumiin? Mitä mieltä olette kaupunkiviljelystä? Thank you Dario for your kind comment! I agree! I'm happy you like the photos even though you normally don't visit urban areas. I am a very urban girl, love big citys, love people and love events! Thanks Alissa for your kind comment :) I like good energy and events too! I'm sure your English is great! Wow, you've missed out on a lot Adam! I love nature, natural products, farms, animals, everything like that and all those things are actually very close to my heart. I'm definitely not a big city person. I mean I love visiting bigger places but for example I wouldn't live in our capital town. too busy and nervous environment... on the other hand there aren't many events in my little hometown. that's okay though since we have cars and public transport and so much to do at home as well. oh and when it comes to Tanja I have to admit it was not my favourite song. something was missing while she was performing there. it was not strong enough and therefore we got our result. but that's competition. someone wins, all others not. Hi darling, you make your city look even more appealing and unique in this post, these looks such such terrific places to visit. Thanks so much for stopping by...wishing you a productive week ahead! wow....useful tips for me because I'm not so able to do make up! :) you're so precious! This blog post had nothing to do with make up. Thank you so much Denise! I really appreciate it :) Arabia is wonderful, you should definitely get a piece of its ceramics..